This magnificent antique Edwardian sterling silver tray has an oval incurved shaped form, all in the Art Nouveau style. 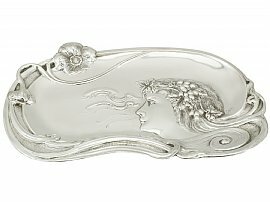 The surface of this Edwardian tray is embellished with an exceptional embossed Art Nouveau style female portrait design accented with fruiting vine ornamentation to her flowing hair. The raised rounded shaped border incorporates the character's hair in addition to embossed floral ornamentation segmented with panels of matte ornamentation. This antique silver dressing table tray is magnificent in its own right and the finest of its type you could hope to acquire. This antique Edwardian silver dressing table tray is an exceptional gauge of silver, exceptional quality and in exceptional presentation condition. The embossed ornamentation is all very sharp. Reflections in photographs may detract from the true representation of this sterling silver dressing table tray.